As the only fund focused solely on mission-oriented banks, NCIF has investments in 12% of all certified CDFI Banks. Our investment in mission-oriented institutions is important not only for the stability of these institutions, but also for the well-being of the small businesses, families, and organizations in the communities they serve. NCIF invests Tier 1 and Tier 2 capital in mission-oriented banks. 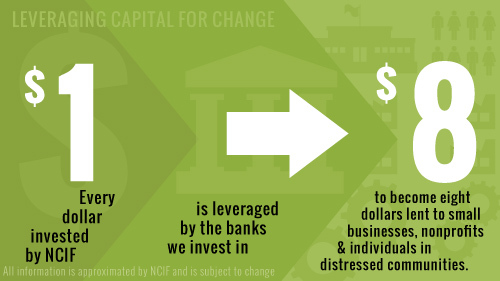 NCIF’s equity investments enable banks to leverage dollars 8 to 10 times with deposits, magnifying the investment’s power to impact local economies. Investees are vetted through a rigorous system, and must demonstrate a strong dedication to mission throughout the life of the investment. In the past, NCIF has made secondary capital investments to support low-income credit unions in communities with extremely limited access to financial products and services. Is your mission-oriented bank raising capital? View our investment criteria. NCIF’s investees have originated billions of dollars in development loans to help small businesses, families, and organizations in economically distressed communities. Read more.